PESHAWAR: The trade of sacrificial animals including buffaloes, cows, goats and sheep has picked up momentum in Khyber Pakhtunkhwa ahead of Eidul Azha celebrations amid complaints of high prices by people at cattle markets on Thursday. As only few days left in Eidul Azha, sale of sacrificial animals gained momentum in all cattle markets where cows, buffaloes, goats, sheep and camels were brought by inter-provincial dealers in large scale to take full advantage of the situation. A survey to the different cattle markets revealed that sacrificial animals has started pouring in from Punjab, Sindh and different far-flung districts in a bid to get maximum profit in the lucrative market of Peshawar. The camels are also brought from Southern Punjab and Sindh province by the traders as it was being the preferred choice of many families. The businessmen of Punjab and Sindh provinces besides domestic traders have brought their stock in large quantity to Peshawar attracting buyers not only from Pakhtunkhwa but also from neighbouring Afghanistan to fulfill people’s needs on the occasion of Eidul Azha. “I have brought 12 trucks from Sahiwal and my brother will send eight more trucks shortly to Peshawar to get maximum profits here,” said Wahid Ali, a trader at Lalla Kala cattle market near Peshawar. “I had refused an offer of Rs150,000 for my ox ‘Qalandar’ as I was demanding Rs180,000 for it,” he added. The people are seen visiting different localities for buying sacrificial animals at Lala Kala market, Pajagai and Ring Roads in Peshawar. In these cattle markets, it was observed that the visitors were more in number than buyers as most of them came to markets to have an idea about the prices these days. However, the traders are expecting increase of sale in the last three days of Eidul Azha. “I have sold only 10 oxen out of 30 available with me in Pachagai cattle market since last Tuesday as buyers mostly comes these days to markets to take an idea about the prices and then return empty hands,” said Mosa Khan, a cattle trader in Pachagai Road. “High cost of fodder, transportation of animals and high-fee of the cattle market owners were contributing to an increase in cattle prices on occasion of Eidul Azha,” he said. In these markets, it was observed that most of the buyers were showing interest in purchase of buffaloes, cows, oxen instead of goats, sheep and camels to performing collective sacrifice due to high prices of small animals. The traders have also started roaming in streets and villages with their decorated animals to attract buyers. Dr Aftab Khan, a veterinary doctor said that they have no choice but to import cattle from Punjab to ensure availability of the sacrificial animals on reasonable rates to people. 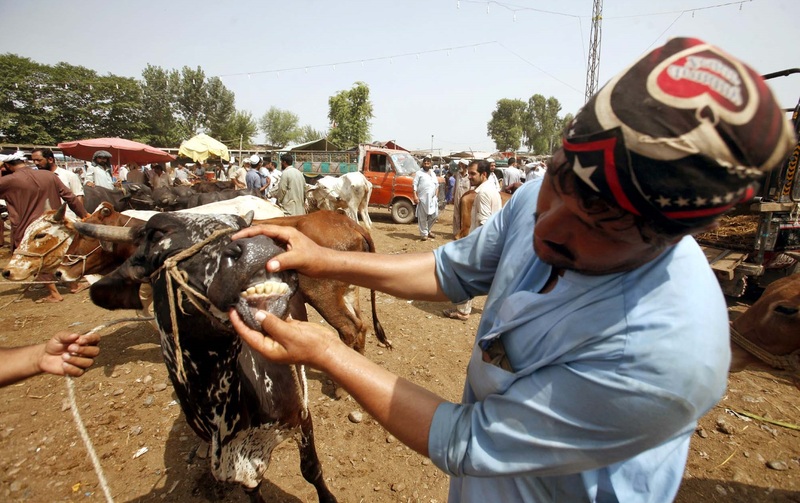 He said that around 65 to 75 percent cattle were being brought from Punjab to bring the prices down in the province.